I am a planner so these well-worn clichés are etched into my psyche. This is why every Sunday I lay out a plan for the upcoming week integrating both the professional and personal parts of my life. It’s a ritual I will not miss. I review the previous week and see what was left undone and decide what to do with them (add them to the upcoming week, not do them at all, etc.). I compile all the ideas, tasks and thoughts I’ve collected over the previous week and add them to my master Outlook Task List. Next I look two to three weeks out in my calendar and add to my list any work I need to do to be ready for upcoming meetings and events. I will also resolve any scheduling issues. I may block out time in my calendar to focus on an important task that requires quiet to do well. 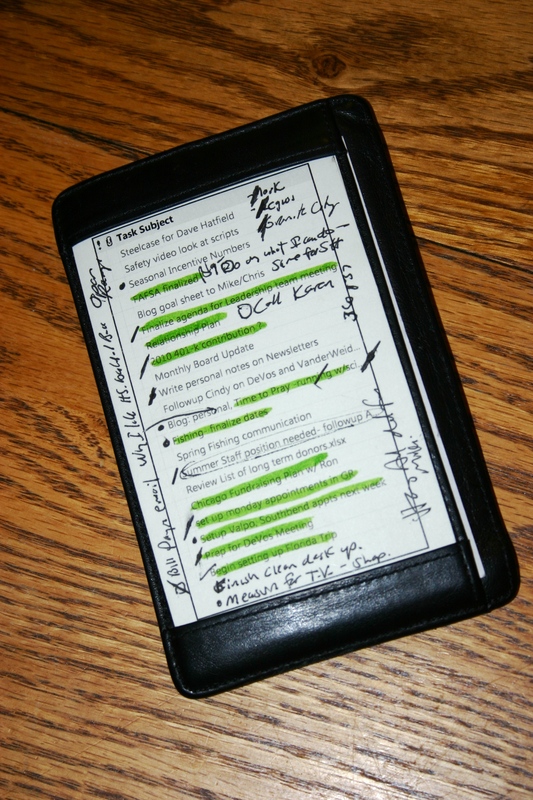 Then I will print a pocket-size card of the tasks I’ve chosen to focus for the week. It stays with me (held in a Levenger “shirt pocket briefcase“) all the time. If my list doesn’t fit on a 3″ by 5” card then it’s too long. Finally, each morning I will evaluate the previous day and then highlight the tasks that I want to achieve that day. Simple enough yet when I don’t create a plan I feel as if I’m going through my week running with scissors. When I do I enter each day with confidence that I know what I need to do to have a successful week. sounds a lot like David Allen’s “Getting Things Done.” Get it out of your head and into a useful retrieval system. Speaking of retrieval systems, I recommend looking into OmniFocus for iPad for a list/organization tool. The only drawback for you specifically is syncing it into Outlook which I don’t think it does. So when you’re ready to migrate to a completely Mac ecosystem, (hint, hint) this might be an effective solution for you. Thanks Chris for the recommendation. One day a total Mac ecosystem may happen. Also love David Allen’s “Getting Things Done” though I picked up much of my system from the old Franklin Day Planner stuff as well as Covey’s pre merger time management system. Principles are very similar. I’m seeing a Valpo stop on your things to plan for. Does that mean Kerith and I get to see you on our turf? Sure hope so!